A gift of fresh fruit and gourmet snacks is a traditional way to let recipients know they are in your thoughts during a time of bereavement. An experienced local florist will prepare and deliver a basket with fresh fruits that may include apples, pears, grapes, or oranges, as well as gourmet foods that may include cheeses, crackers, coffee, or chocolate. Photo shown is an example only. Specific fruits, container, ribbon, or item shown will change based on local availability or florist preference. Arrives in a tasteful wicker basket, ready to be displayed. Hand delivered to your desired location by experienced florists. Deepest Sympathy Fruit and Gourmet Basket is a hand delivered gift. These gifts are delivered by one of our local design centers located throughout the United States and Canada. Same day delivery is available for most gifts when ordered before the cutoff time. The cutoff time for Deepest Sympathy Fruit and Gourmet Basket is in the recipient's time zone. Our family received this beautiful basket in honor of a loved one on the day of his services in another country. We are 300 miles away, so it was the perfect gift. We were able to call at the last minute to edit the card. Customer Service Rep Matt was very helpful and made the changes graciously. Love the 24 hour service. Thank you... will use again! The recipient of the basket raved about the size of it and the amount of goodies included....he said it was al delicious. It was delivered the same day I ordered as promised. This basket was for my ex husbands father's funeral and it was big, beautiful well organized and full of goodies. My ex said his family was surprised and delighted by it. They appreciated the assortment. Thank you for making a sad time a little brighter! Was delivered same day ordered at 10:30 had it by 2:00 p.m. Ordered for the owners of the company I work for. They had lost their son earlier in the week. They were going for the weekend for a much needed rest. They took the fruit basket with them and both loved it. Will be ordering again - so much more than flowers would have been. HAPPY thank you. I ordered two of these baskets in one week due to two families losing a loved one. Both families commented that the basket, its contents and the overall arrangement were beautiful. They were touched by the thoughtfulness. I would highly recommend sending this sympathy basket because it is a tasteful and appropriate gift during a very sad time. Even after errors in ordering - this basket was delivered in less than 24 hours of ordering. It was bought in memory of my Mother in law's last remaining sibling. I picked this one as it was best suited for all ages. It was enjoyed by all. My Mom got a big thank you call from all the girls- it was a big hit. The big hit with me was how the errors in order were corrected with lightening speed. I will be using this site again and have already referred several folks to this site. Sent this to my cousin and family in Delaware. It was a great comfort food basket with red and green , pears, oranges, grapefruit, grapes, chips, cheese and hard candies. It came on a timely manner. Very happy with this purchase and the timely delivery to their house. Basket arrived promptly, in excellent condition, and was so much appreciated, I received a phone call immediately thanking me for my thoughtfulness. Arrived as requested and they enjoyed it. I sent this sympathy fruit basket to my uncle in N.Y. State who just lost his wife (my aunt) of 61 years. There are no words to comfort a loss such as this, but this fruit basket not only arrived in such a speedy manner it was a big, beautiful blessing, as well!!! My uncle and cousins were amazed at how big and beautiful it was!!! I live in Oklahoma and was a little hesitant to order a fruit basket from any company because of lack of knowledge in this area. When I saw the Gift Tree website the items offered were very impressive. When I talked to my sister-in-law who works in a florist here in Oklahoma, she told me they use the Gift Tree all the time and they were a very good company. That's all I needed to know. I used the Gift Tree and was BEYOND pleased with every aspect of this transaction. I would highly recommend The Gift Tree and will be a returning customer for sure!!! Thank you again!!! You did great. The family was very pleased with the basket. Loved the presentation and the fruit was amazing. Thanks for working with me on the delivery. The person who received it said it was the best fruit basket he ever saw! And the fruit was delicious! The gift was an excellent choice. The customer service was excellent and the gift arrived in a timely manner. We had a "rush" request for a sympathy basket delivery for a friend in Illinois. The order was well prepared, of high quality, and most importantly arrived the day we placed the order!! I will use this site again and recommend the service! Basket was beautifully displayed. Everything was fresh. Delivery was excellent. Gift was truly appreciated. Thank you for your wonderful service! Recipient was pleased with gift. While I did not see the basket myself, the recipients described it as beautiful. I was especially impressed with delivery services -- timely despite short notice, inclement weather pre-Thanksgiving holiday chaos. I will definitely order again! My sister and her family loved the basket and the white rose was such a heart warming touch. I would definitely recommend this basket if you want to brighten someones day. My sister said it was great and the rose was so nice! It is on all my nieces' Facebook pages in memory of their sister and my niece loved it. Great job. Would order again! This was easy to order. I was very impressed with the fast service they expedited. Great job. We benchmarked many sympathy gift baskets after two days trying to figure out which one was best for this sad occasion. Your offer was the best. Thanks so much. Our client loved the basket and even sent us photos of it with a thank you card. Recipient loved the basket and it was large and plentiful enough for a family to enjoy. A great gift! When a family expresses that they do not wish to receive flowers, yet you would like to send a friend or co-worker something to let them know you care - this basket is a great choice. My co-worker was able to snack on the fruit when she didn't feel like cooking, there are also many other treats and treasures in the basket that distracted her for a time and lifted her spirits. I've ordered this several times and always received good feedback. My friend, who received this gift, commented that it was absolutely beautiful and that she would highly recommend to others. It was delivered the same day I ordered it and, although I didn't personally see it, she said the food was good and that she and her family "tore into it" the moment it arrived. I will order gift baskets from you again! This is the first time that I have used this site and I was a little nervous about using them but I needed a delivery quickly. One of my best friends lost her father and I am out of the country and could not be there for her. They guaranteed delivery the next day. The lady that assisted me was very helpful and professional on the phone. She told me the basket that I ordered was one of their popular ones. The basket arrived the next day and my friend said that it was beautiful. I am so happy that it arrived on time and made a great presentation. I will be using this site again! I ordered the Sympathy and Gourmet Fruit Basket as an alternative to traditional flowers. The ordering process was quick and easy, and the basket was delivered out-of-state the next day. The recipients said the basket was beautiful and timely. I would definitely consider ordering this basket as alternative in the future. Although I had asked the basket to be left on the doorstep if no one was home, the basket was not delivered that day. However, they contacted me and delivered the next day. They corrected the problem immediately and were very helpful and apologetic. The recipient also loved the basket. I did not see the basket but was told it was very nice and had a good variety. Thank you. We sent this basket to a neighbor who's wife just passed away. He loved it. The fruit was fresh and the basket was beautiful. Also, I ordered it for same day delivery and it arrived right on time. This was the perfect gift to send to a friend who recently lost a loved one. With family in from out-of-town, it arrived in time for all to enjoy. The recipient stated, "fruit and gourmet items were presented very nicely in the basket, as though done with great thoughtfulness". I did not see this basket; it was sent to a friend of mine that lives about 40 miles from me. I liked the fact that this company had a basket to fit my needs and was able to deliver it within 24 hours. That alone was worth the price. My friend called me to thank me for the "Beautiful basket" that I sent her. Her words "It was refreshing to get real fruit and lots of it". I will definitely use this company again. I would recommend it to everyone. My co-worker said the basket i sent was good. My company has ordered a couple different sympathy baskets that have been well recieved. Unfortunately I did not see them in person but what I did see what how easy the process to order with this site is and recommended them to others in my company immediately after placing my last order. I was even able to get same day delivery and confirmation of delivery which made it even easier. I am very impressed! Sent this basket to casual friend, from a group of people. Was delivered on time, without extra fee, which was main reason for choosing this site. Did not see actual product, so cannot comment on the quality of product. No glowing comments from the receiver, but it was much appreciated. So can't say anything else on product. being from mass. I went on line...read many nice reviews....and tried your co. because of them. I heard back sev. days later from recipient who was absolutely thrilled with everything about the basket. I mean everything. quality and quantity of items in basket sounded just perfect. thank you....thank you for making this a nice experience during a difficult time. The family that received this basket described it as very beautiful, and that it had a wonderful variety of snacks and an abundance of fruit. This basket was a great alternative to sending flowers or a plant - just to let someone know that your thoughts are with them. I sent this gift to a friend's family who recentlly lost a love one. They commented how beautiful the basket was and quality of the fruit. DELIVERY WAS VERY IMPRESSIVE . SERVICE & DISPLAY OF BASKET WAS INCREDIBLE . THANK YOU FOR ALL YOUR HELP. i WOULD RECOMMEND. The recipient was extremely happy. They said it was beautiful and plentiful. I will definatally6 use you again. We ordered the sympathy basket this morning, and within a couple of hours received thanks by email from the grieving family, praising the beauty and originality of the gift. I am blown away by how prompt you are, by how easy it is to order, and by the appropriateness of the basket. We are fans now, and I'll definitely use this site again and again. Many thanks! Recipient was a co-worker and family. They were very pleased with the gift and stated that it was very beautiful and very much enjoyed. I didn't get to see the actual basket but my aunt raved about how beautiful it was. The basket was very well received and filled with delicious treats and fruit. I would definitely recommend this basket. Thank you for your excellent service. I ordered this for a co-worker/friend who lost his father. The "Thank you" email I received from him was so heartfelt. He said the basket was beautiful and really made the hard time he was going through easier. I had looked on other websites and got the best product with this site for the money. I sent this basket to a friend in Pennsylvania as a sympathy gift. They told me it was beautiful. This basket was outstanding and a much better way to express sympathy than just sending flowers.We couldn't make the funeral because it was out of state so this was by far the best way for us to express our sympathy with the family. It was sent as a sympathy basket and I didn't get to see it but my friend told me it was a great basket with a lot of items. They were very happy with it. I wish I could have seen it to give a better review. Sent the sympathy basket to a dear friend who lost her sister. She called excited about the the "beautiful, huge, and so heavy that the delivery man had to carry it in" and put on her dinning table. She could not be happier. I have not received any of your gifts; however, have sent four recently and the response is always the same - lovely, delicious and so appreciative. 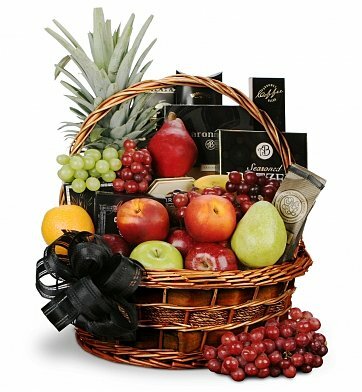 we sent a deluxe sympathy fruit basket to the family of a close friend that passed. They were very appreciative & impressed with the basket. They sent a picture and said it was gorgeous. I cannot believe the fastest delivery ever! I ordered it and 2 hours later it arrived, at no additional cost. I definetly recommend this site, I will use them again. They offer a wider variety than Harry & David, Pro flowers etc. , and they have unique gifts as well. Great service, beautiful basket. Would highly recommend this company. My secret personal assistant! I love the ease of selecting something for whatever occasion. I especially love the attention my orders get if I neglected to be clear about something. And, most often I have to leave my phone number for them to call if there are delivery issues and they are always on top of delivery challenges. I had never heard of this company before I did an online search for a sympathy gift basket. The company that I usually use had too much candy, etc in them and the baskets looked a little too cheerful for this occasion. My friend, who lost her Father, was grief-stricken and does not eat a lot of unhealthy foods. I wanted something that contained a great mix and included fruits. Everyone in the receiving family raved about it and said that it was really beautiful as well. It seemed like a good value for what I was getting, along with the contents and appearance being what I wanted for this family. I will always use this company again for all future gift basket needs! I didn't get to see the actual basket but the recipient that received it raved about how beautiful it was. I appreciate the quick turnaroun and delivery. I sent this basket to a friend in an area that is very out of the way to get to and the basket arrived the next day because this site made it happen for me. I have never used this website before so I was a bit nervous. I didn't see the final product in person, but I heard from several people that it was beautiful. I even received a call from the delivery person to let me know where they were leaving the package because no one was home when delivery was being made. I will definitely order from these good folks again in the future. of quality fruit and goodies! I sent this basket to one of my Mom's fiiends whose son died. She couldn't stop talking about the basket (its presentation). She said everything you could think of was in the basket. I have told friends of mine, if unfortunately you need to send something for a funeral -send a sympathy fruit and gourmet basket from this site. I would definitey recommend this basket. Customer service rep was great, he was very sensitive to my needs, this gift was for an employee who had a tragic death in the family out of state. The rep took his time to help me find the perfect and appropriate gift. I just got word back from our employee that the basket was delivered the same day I ordered it, and it was an amazing gift. I wish I wrote the reps name down, he really went above and beyond to help with a difficult task. Thank you! Everyone in the family loved the beautiful fruit basket. They all commented on the lovely arrangement of tasty fruit and snacks. The delivery was exactly as promised. With your outstanding service and excellent products, I will certainly be using your company again. Everything was beautiful about this sympathy fruit basket... for this unhappy evening this basket was a topic of conversation. From NY i called with about 4 hours till the wake...There was not to be a second day... not even a burial so no one was to be there after 9PM... But you got it there on time and I thank you so much. I ordered this basket at 9:15am and it was delivered before 2pm the same day! Great gift for a corporate office to send to an employee at their time of need. We have sent several and always had great reviews! Evelyn and the local vendors made this happen. A friend lost a mother suddenly and I received the address for the ceremony on a Friday, yet this basket was able to arrive to the home by Sunday and meant a great deal to the family, provided some comfort during a very difficult time. Thank you. I am so grateful to you for making this happen, in particular Evelyn who involved herself in the process. A close friend lost his mom and I received the address for the Sunday funeral on a Friday evening, Evelyn and the local vendor conspired to bring my friend and his sister a beautiful and much appreciated basket, on time. I was told it was "appreciated" and "comforting". Thank you Evelyn and local vendors for creating a gourmet, and most important, timely, basket. You are the best and have earned a long term customer. This is a great service. My friend said the basket was beautiful and she enjoyed being able to have a snake while taking care of funeral and family. I was very impressed that this website was able to deliver the basket the same day I ordered. Ordering on-line was convenient and I got to see what I was buying. I highly recommend this company and this basket. I have ordered from them before and have been pleased each time. the family loved the arrangement, and said the fruit was excellent. The gift was most appreciated. There were lots of treats in addition to the wonderful fruit. The recipients were very pleased with this lovely basket. I was very impressed with the speedy service. would definately use this site again. We were very impressed with the expedient delivery of your sympathy basket to our family members and friends shortly after the loss of their dad. The family thought it was a wonderful expression of our sympathy and the basket offered a wonderful variety of treats. The family members raved about this basket. First time I ever used your company & will certainly use you again! The Sympathy Fruit and Gourmet Basket made quite an impression on our friend and her family. We were so lucky to find you, because other companies would not deliever for at least a week or more due to the holidays. I ordered this arrangement the day before and it showed up the next day. The arrangement was beautiful! I recommend this to everyone. THANK YOU FOR THE QUICK DELIVERY OF THIS FRUIT BASKET. THE RECIPIENT ARE OVERJOYED WITH ALL THE DFFERENT CONTENTS. The person who delivered the gift to our person said, "I'm sorry for your loss", upon delivery. This was incredible customer service! This was a very unhappy gathering, yet the fruit was great. My friends and family were very pleased. So we had a problem with the type of basket our cousin recieved...contacted customer service and they were very promt in making things right!! This beautiful basket of fruits and other gourmet goodies was delivered same day - very soon after I ordered it from a town on Long Island, NY, to a small community in Michigan. The computer did it all and did it so well! The mourners who received it took the time to call me and express their delight with this lovely basket. It was generously filled and very much appreciated. I have used this site; it is a classy, consistent and excellent service. Thanks. By the way, I rated you excellent, but the computer would not register it (above my comment). Sent so fast...but wasn't "rushed"
This basket was ordered @ 11AM, and delivered by the end of the business day on the same day. It had very fresh fruit and it was very much appreciated by the recipients. Even though it was sent very fast, it didn't look "rushed"...very, VERY happy with our purchase. I've sent this gift 3 times in the last 2 years and it has always been appreciated. The fruit was perfect and the other goodies- cheese, crackers, coffee- were exactly what my relatives needed at a time when they weren't up to eating meals. I got the most wonderful feedback from the person I sent the basket to. He could'nt get over how beautiful, wonderful and thoughtful it was, It was a funeral basket. I wanted it to be something different than the usual flowers sent to the funeral home. I wanted it to be for the person that I knew and respected and felt grief for. Thank you for making it special and delivering it according to my instructions. I deffinetly will pass your name to other colleagues that order baskets.